Taking on Oryx Challenge mode? Follow this guide to reign triumphant. Bungie has unlocked the final Challenge Mode in The King’s Fall Raid, and it’s honestly not too hard. In fact, we dare say that this efficient strategy could become the most widely practiced from now on. 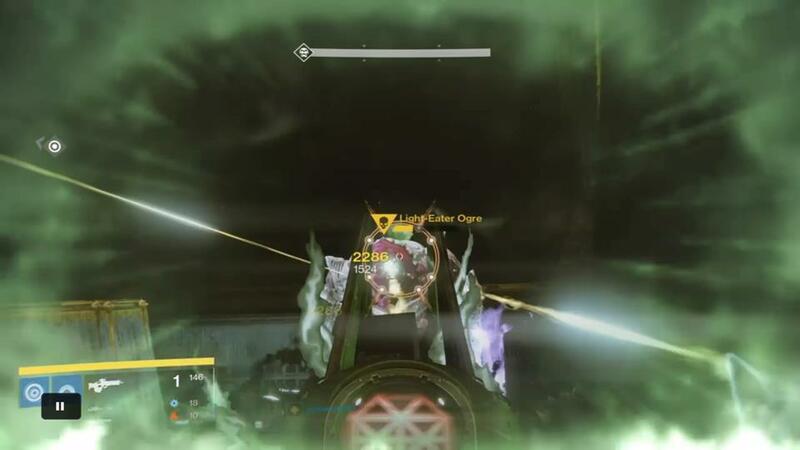 There really are no corners to cut in the final encounter of the King’s Fall Raid while playing Heroic. There are, however, ways of manipulating the mechanics to suit the capabilities of your fireteam. 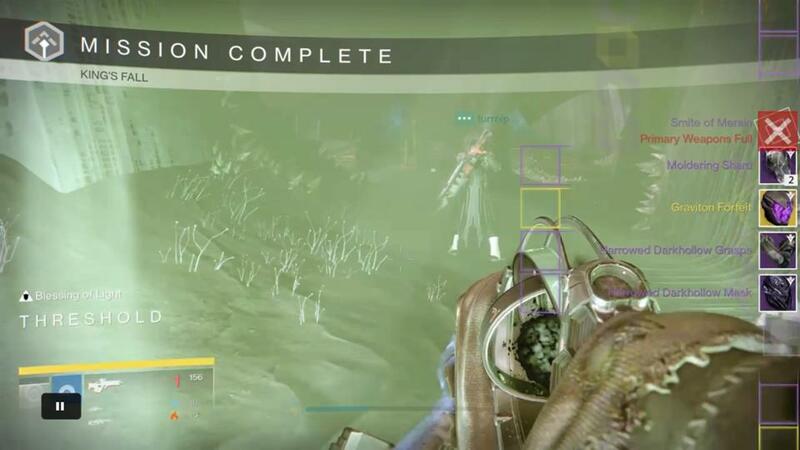 But this is Challenge Mode, and the rules for defeating Oryx are pretty much set in stone. It’s how you handle the risks that’ll make the most difference, but having a clear strategy helps to focus. Two sequences stand out as the most problematic and frustrating of the Oryx encounter: running away from light bombs, and surviving the Shade battle inside the Darkness Dimension. The bad news is that the Oryx Challenge hinges so much on the latter. The great news is that dodging light bombs and Taken Knight walls of flame is something you may never need to worry about ever again. To understand how this Challenge gets done, it’s good to know the theory behind it. 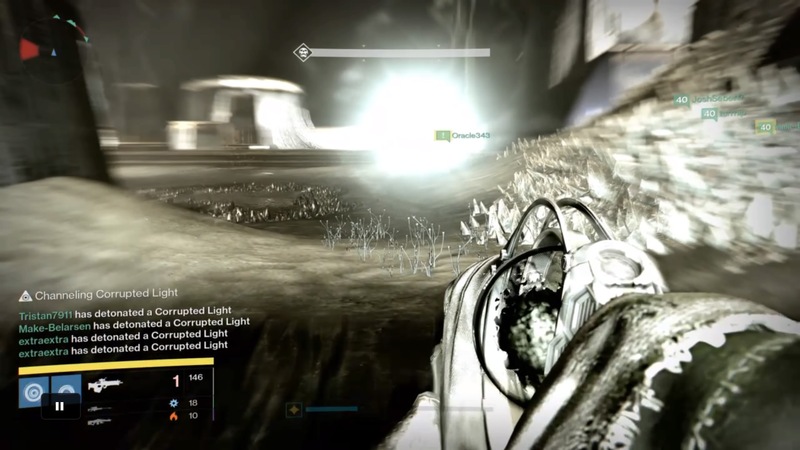 In short, Oryx is mainly hurt by the explosions of the Blight bombs. Shooting at his chest when it opens only serves to stagger him long enough to detonate the Blight bombs, and it takes a total of 16 to destroy him. If you ‘fail’ to detonate a single Blight bomb during one sequence, Oryx summons the Darkness Dimension to send the Shade of Oryx after your team. The prevailing school of thought until now has been that this is some kind of intimidation tactic for being basically incompetent. 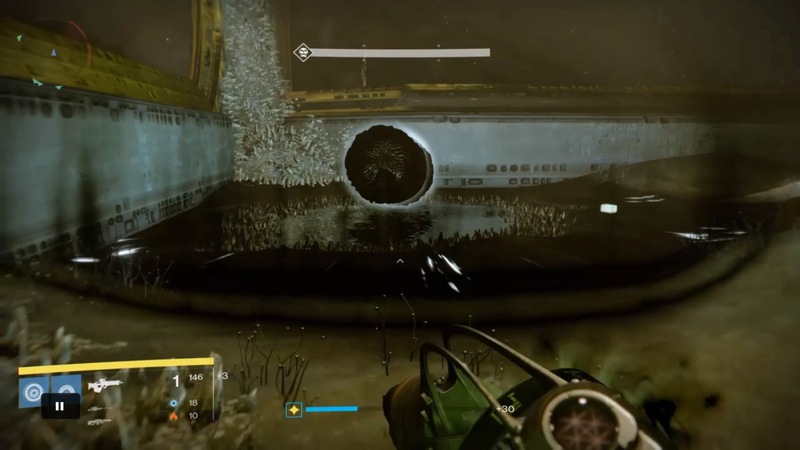 Until now, teams have been looking to detonate all four Blight bombs to deplete precisely 25 percent of Oryx’s health. Then it’s time to run circles around allocated plates, or jump-dash along the centre corridor while some poor sod gets dizzy sprinting miniscule laps atop one of the defeated Daughters’ platforms. It hasn’t mattered much if only two or three bombs have been put to work, just as long as everyone is cool with the running thing, downing your Ogres in good time, defeating Light Eater Knights or not. So, what if you just don’t detonate any of the bombs on purpose? Respect to those teams that have already been running this as their weekly strategy because this is the crux of the Oryx Challenge: Arrange 16 perfectly placed bombs to detonate simultaneously, and the Taken King instantly dies. Assemble a fireteam that includes at least one Defender Titan, with Blessings of Light enabled. The Titan’s role is to provide additional DPS when taking down Light-Eater Ogres, the Blessings allowing them to equip Touch of Malice and shoot the Ogres as they appear in sequence, always protected. 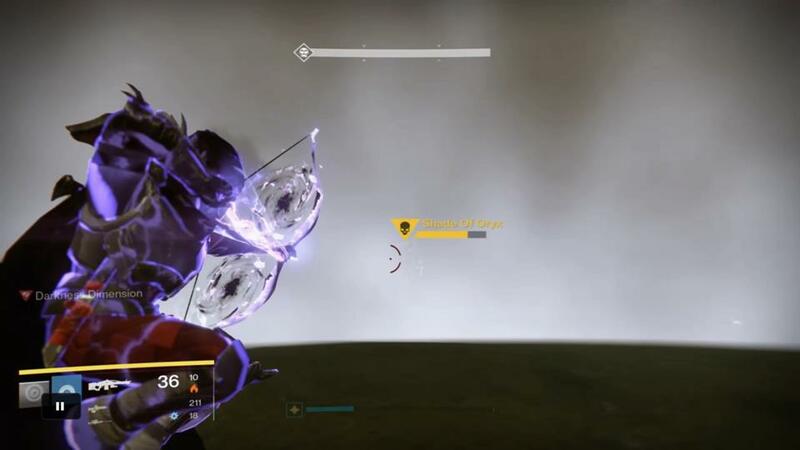 There should also be at least one Nightstalker Hunter to generate Orbs with Black Hole Shadowshot when the encounter begins. The remaining Guardians should be everyone’s highest Light level, but Sunsinger Warlocks whose Fireborn lets them self-revive are a great fallback. Finally, elect your most reliable runner. With the runner and Titan DPS guy already decided, the first business is assigning Guardians to activation plates. There are two ways to go about this, depending on the strength of your team. The easiest to manage method is to pick specific plates: front-left, front-right, back-left and back-right. This plate, its Ogre and Light-Eater Knight is then that Guardian’s responsibility for the whole encounter. Whoever’s plate is last in sequence becomes your ‘floater’, free to join the Titan in the middle of the room and assist with DPS on Ogres then adds using Touch of Malice. Alternatively, you may wish to assign a permanent DPS buddy for the Titan, which means that the remaining three guys choose to be number one, two or three and take up positions on the plates in the order that Oryx slams. One is first up after the runner, then two and three in the anti-clockwise sequence so that your runner has a stairway to the Spark. One of the DPS guys needs to know the final plate in sequence for the last round, in order to have four Guardians detonating bombs. In either case, be aware that the Light-Eater Knight from Ogre four may need stopping in its tracks after everyone has assembled to DPS Oryx under the protection of the Aura of Immortality. Your main consideration after shooting Ogres and ideally all the Knights is to stay alive for four rounds. Before triggering the event, ensure that your Nightstalker Hunter has a Super ready to ensnare the first wave of adds that approach from front left and front right. Everyone should hang back behind the daughters’ empty pillars to target the adds that have been tethered by a Black Hole Shadowshot. This generates Orbs to fuel the DPS Titan’s Super in the main, but of course everyone else benefits. After killing the first wave of adds, Oryx chooses his first plate to slam at the front of the room. 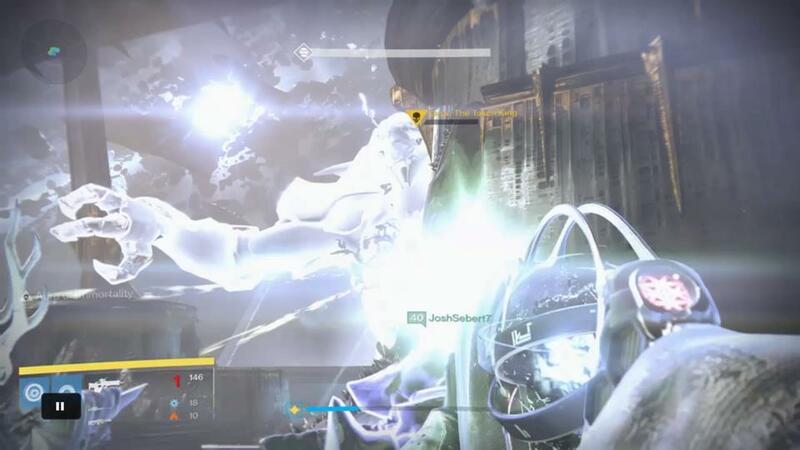 Your DPS Titan activates a Blessings of Light bubble to protect themselves and the ‘floater’, both of them firing upon Ogres in order of appearance anti-clockwise, dipping into the Blessings between times. Your runner is first to go, followed by the allocated Guardian for that plate and the subsequent guys in sequence. It is essential that the Ogres fall quickly, so each Guardian on the plates are advised to use Heavy Machine Guns to waste the Ogre next to their plate, and assist with sniper fire to drop the Ogre on the opposite side. In addition to placing Blight bombs where you need them, swift kills buy the plate guys valuable seconds to line-up Light-Eater Ogres in their sniper rifle sights as they appear across the way. The runner usually grabs the Spark at the moment the fourth Ogre is killed, at which point everybody should hurry to assemble with the DPS guys under the protection of their Blessings. It’s likely that the fourth Light-Eater Knight is still active since it’s tricky to snipe him down in time. Have one Guardian stop him in his tracks while the rest concentrate on dropping the Vessel fast. 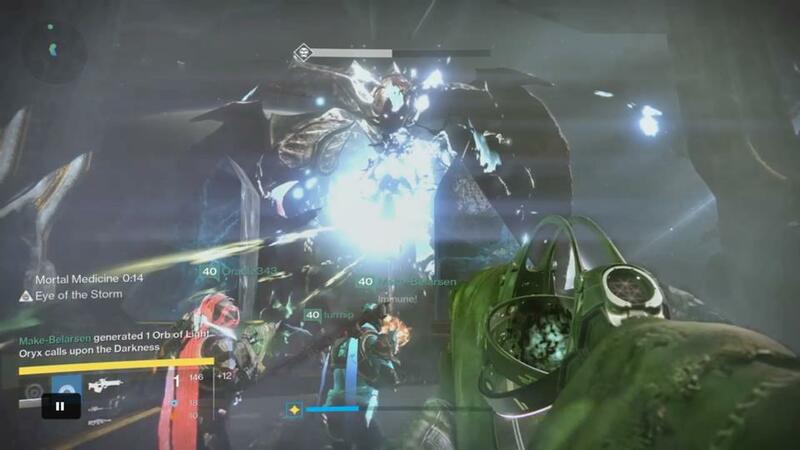 Oryx summons the Darkness Dimension and the team is transported one by one into the bubble. More adds appear, which include Taken Knights on the front plates, all of which must be stopped. There are two things to bear in mind for surviving your tango with the Shade: try to have your most confident player attract the Shade’s attention as it searches for victims to slam. That player can leap over the Shade’s head as it slams to avoid taking the additional splash damage. If they are a Warlock, their self-revive can come to the rescue if they are killed. The rest of the team stays out of the way. The other important rule is never to tether the shade while it is in the centre of the bubble. Tether after it has slammed, and is on the outskirts of the bubble. Follow routines A, B and C exactly as before two more times, ideally leaving two more sets of Blight bombs in exactly the same positions as the first round. After emerging from the Darkness Dimension a third time, with 12 bombs already in place, you only need to repeat routines A and B because after clearing all the adds it is time to detonate all the bombs. There is no huge rush. Make sure that the areas in front and back are completely clear of adds and that the person responsible for plate four is crystal about which one this is. Have one person, usually the runner, provide a countdown from three to send out the detonation team. Each detonator must wait for their name to appear in the HUD before rushing back to the Aura of Immortality. 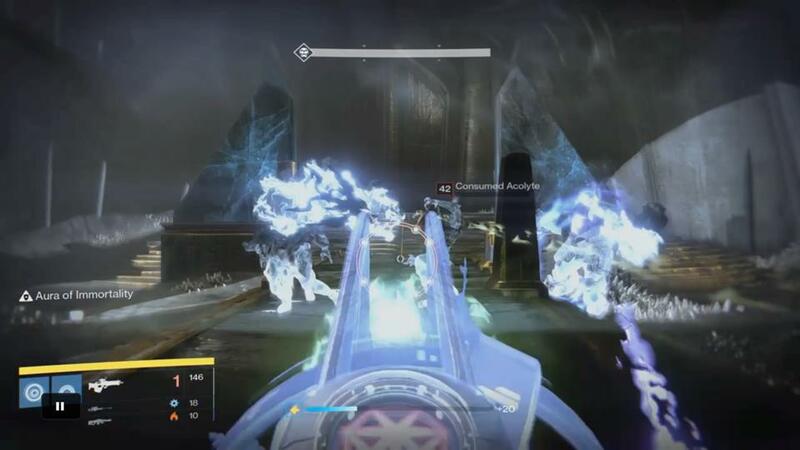 Sixteen Blight bombs explode in unison, completely depleting Oryx’s health. Your work is almost done. After all the bombs have exploded, the last remaining thing to do is face Oryx at the front of the room and shoot at his chest the moment it opens. 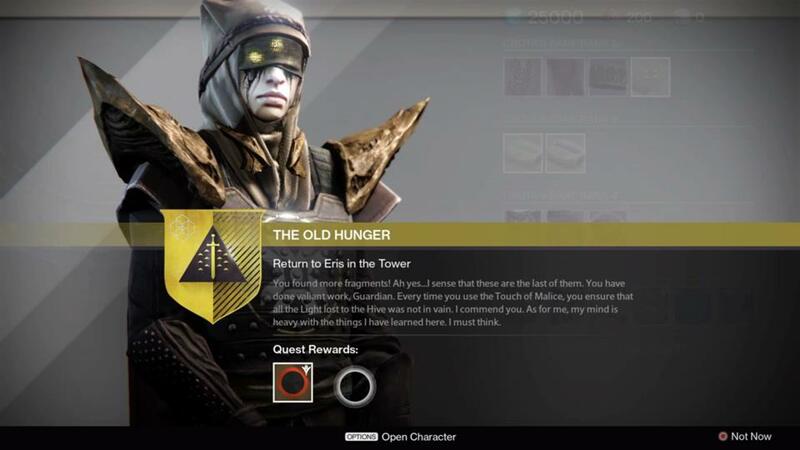 If you have performed each routine exactly as described, the King is dead (again) and you’ll have a new Emblem, Ship and 320 Light gear to collect. Oh, and Calcified Fragment XLV to complete your collection of 50… if you’ve been especially smart. Now, it could be that the team missed some Light-Eater Knights along the way. If this is known for sure or suspected to be the case, the simple thing to do is run Routines A, B and C one more time so that you have at least 16 bombs to detonate. You may end up with 20, but the more the merrier.